With more and more projects being migrated to Magento 2, and showcased by partners and Magento themselves, what’s the status of Magento 2 adoption within the partner ecosystem? Is there any way merchants can tell “heaven from hell” when deciding what partner to go with when planning and delivering a Magento 2 project? 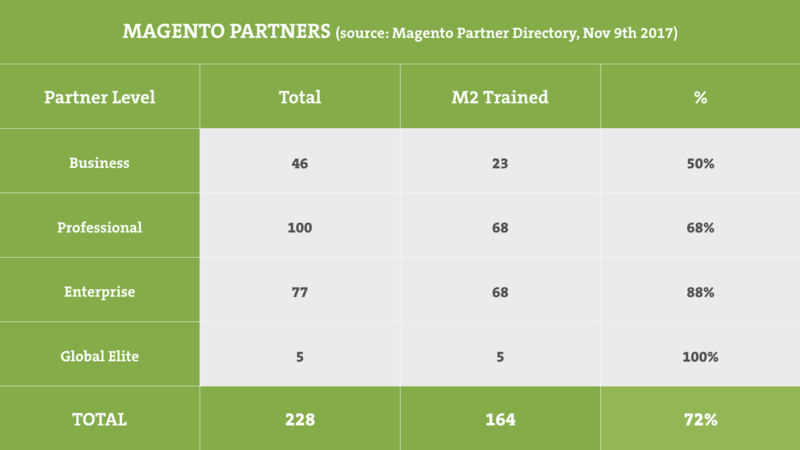 Did you know that (only) 72% of Magento solution partners are Magento 2 trained? So, Magento 2 has been out for quite some time (have you noticed)? It didn’t come quietly, and nothing about it has been quite around Magento ecosystem. Now, with many websites (still) running on various Magento 1 versions, many merchants are planning their move to Magento 2 for 2018. Not to forget, someone who is completely new to eCommerce or is looking at switching platforms may also be considering Magento. For them, the number 2 doesn’t really mean that much and they won’t get too excited. They only want a working software and a quality team to help them build and grow their business. I took some time to go over the Magento partner directory and crunch some numbers. Now, there is still no formal developer certification in place for Magento 2 (Solution Specialist one has rolled out, though). So, I wanted to see is there any way to compare partners or get some insight into how focused and experienced they are with the newest Magento software? How many Magento 2 trained partners are out there? Solution Partners were invited by Magento (originally back in late 2015 with a follow-up in late 2016) to have their employees trained on the new platform. This was done by completing official Magento 2 trainings (frontend and backend). When people from partner teams completed these trainings, this showed on partner profiles in a form of a Magento 2 Trained Partner badge. These trainings were intended to boost Magento 2 acceptance and readiness of solution partners. The main purpose was to be better equipped when planning and delivering projects for existing and new Magento clients. So, fast forward a year or two, and where are we now? Here is an overview of all Magento Solution Partners by partner level and their Magento 2 Trained status. Numbers shown are based on the analysis of the partner directory on November 9, 2017. To check/verify these figures, and get some more insights, check Magento partner website. Over there you can get into partner search and then narrow down with a couple of filtering options. This way everyone can see which partners are Magento 2 Trained. Additionally, when inside specific partner profiles, you’ll find more details about each partner. Is Magento 2 training any proof of quality of services rendered by partners? Not really. Partners receive a Magento 2 Trained Partner badge when their employees pass some of the official Magento training programs. These don’t reflect real-life experience with Magento 2 and these are not official certifications. Then is it important and why? It is important because it shows, like official certifications, commitment and effort, rather than actual quality of delivery. Quality can vary even for several merchants working with the same solution partner. This is something I’m sure many Magento clients are aware of. Let’s face it – you can only truly know someone after you engage in a cooperation. So, this information (next to all others merchants will gather when deciding who they will work with) is one piece of a larger puzzle. Why are there so many Professional and Enterprise partners who don’t have any of their staff trained for Magento 2? This is a good question (I’m also interested in finding the answer to this), and there can be a number of reasons. Perhaps some partners had people complete the training but have since left the company. Maybe they simply didn’t invest time into formal trainings and focused on delivering Magento 2 projects instead. This way perhaps they are a better choice than some other partners who may have training but no hands-on experience. And there may be some that don’t have either because Magento has not paid special attention to this after the initial rollout. Ok, so how do we know if someone is good at Magento 2? First of all, let me ask you what version are we talking about? 🙂 You should first look for and/or ask for solution partners’ track record. Another good hint at the quality of overall Magento work can be the number of official certificates. These can be found listed on partner profiles. While these will verify mostly M1 expertise and not M2 in particular, it is one of the more solid “proofs” out there right now. What about Magento 2 certification? Magento 2 Solution Specialist certification has rolled out and there are already 124 M2 Certified Solution Specialists out there. Developer certifications, however, will roll out most likely some time during 2018. In the meantime you should take into account all of those things mentioned previously when making a decision on working with a Magento Solution Partner for your eCommerce project. If you would like to see how we at Inchoo can help you out, we’ll be happy to hear from you! Magento 2: launched and available! I have done M2 solution specialist. And I have associated my partner in certification tab. But still I can’t see my certification information in my partner page. I cannot see M2 certification on any of the partners page. I’m planning to take magento 2 solution specialist exam. Can you share me some details regarding this that would really helpful. Aron, very good study about the solution partner. I just have a comment about why only 72% only are Trained. As you know is a presencial training and from company like where I work (Onetree) in South America, make that training means for us invest a lot of more many traveling here the course is taking. If you check the agenda non of the places is near from us. Hope Magento U is planning to make some training in our region so we are going to be there. thanks for your comment. Actually, Magento 2 Trained Partner can be achieved completely online, there is no need to attend any on-site training courses. It’s as simple as completing online training materials and then you get the badge. This is how we did it, we also didn’t have anyone complete an on-site training, so that part is not a blocker to get the M2 Trained Partner status. But, I also agree that it would be great to get more MagentoU on-site training options for partners worldwide.